Engines crankshaft generates energy to the pulley attached, which then provides energy to the engine, which transfers the energy to the car. The crankshaft pulley is responsible for transferring the spinning motion to other pulleys. Our modern car has many pulleys attached to various accessories and components like the power steering pump, air conditioning compressor, water pump, the alternator and more. The alternator takes in the mechanical energy from these pulleys and turns it into electrical energy. This all seems simple but the internal working of an alternator is way more complex. Just like a car, alternator also has a pulley that is attached to it’s rotor. When the voltage is regulated through the wire coil present in the rotor, it produces a magnetic field. The act of rotor spinning inside a set of stationery coils, it’s called stator. This rotating magnetic field then produces an alternate current in the given stationery coil. But a car requires a direct current, not an alternating current. Thus, the alternator has a diode assembly, rectifier, that converts the alternating current to direct current. This current can be used to provide power to run different car accessories and recharge the car’s battery. This all process is heavy for the alternator and so it gets heated. To cool it down, alternators have fans, to help the circulation of air. Please note that we have eliminated a few steps and things to keep this explanation as simple as possible to understand. The alternator only had one job, to maintain a car’s battery charge. But why is it so important to have an alternator? It’s simple. When we use a car, we are not just driving, we use power windows, GPS navigation, Air conditioning, ignition, DVD player and a like. But a car’s battery cannot provide so much energy directly. If the alternator was not present, the car’s battery would have been drained in a very short time, making your drive time very less, making it impossible to run without electricity. 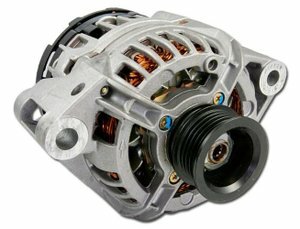 So to make the optimum use of the battery while maintaining it’s life, an alternator is used. Alternators cannot recharge a dead or low battery. Alternators are made to sustain the charge of the battery and cannot recharge a dead or low battery. The alternator sure has one job but it’s too much of work and recharging a low battery or dead battery is just too much for an alternator to take. The working or principles of an alternator is still the same but the design has changed. This can be because our modern car requires more energy to run itself than our old car models. With an increase in specifications of our car today, a simple or old alternator will not suffice the need. Due to this, the size of the alternators have also increased over the time. Modern alternators in our car uses 2 internal fans. These fans keeps the alternator very cool. The fans are attached on to the rotor. Also, our new and improved alternative have spinners that spin at a higher speed. This increases the overall output as more air in the alternator can make it cool faster, indeed making it to perform more efficiently. Is your alternator broken? Replace it with the original company authorised alternator, Lucas TVS, available at Krishna Auto Electric. Contact now for an instant quote!